Random And Some: "The old life is gone forever!" I recently read The Zombie Survival Guide (2003) by World War Z author Max Brooks. Sarah had received the fictional survival manual as a gift after watching Marc Forster's 2013 movie adaptation of the book. Since the movie instilled in her a great fear for the undead, leaving her with weeks of nightmares, she at least wanted to be prepared for when the zombie uprising takes place. I decided to take to guide with me on our trip to Barcelona, cautiously strolling through it not unlike Brad Pitt's Gerry Lane strolling down the aisle during the airplane scene, absorbing everything I possibly could. The Zombie Survival Guide sets out to tell you everything you need to know to survive a zombie outbreak. The book is divided up in seven chapters, each of which deal with different issues and situations. 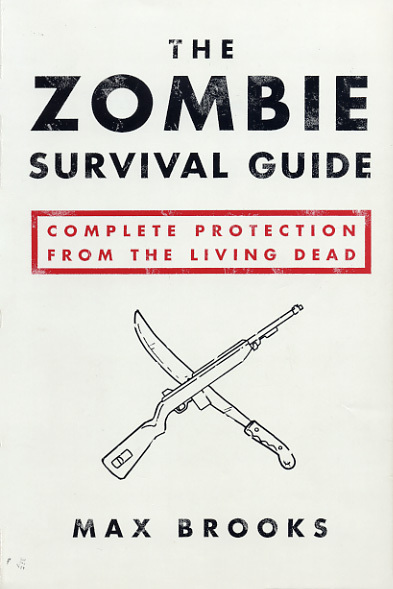 From the first chapter, Myths and Realities (which describes the virus that creates zombies and how it spreads) to Weapons and Combat (which discusses possible weapons and weighs them against each other) and On the Attack (which provides specific tactics for destroying the undead), TZSG covers everything you need to know and offers complete protection through proven tips. Though very exhaustive and laden with illustrations, I found it very difficult to get through certain parts and chapters because of the book's often repetitive structure. The concept is certainly exciting, especially if you like the idea of living in an undead world and taking on zombies, with a lot of enjoyable parts - the recorded attacks, for example - and a somewhat different approach in that it uses a mostly academic delivery. Instead of a plot, Brooks basically delivers a slew of do's and dont's and procedures. Do you want to be informed and well-prepared when the zombie apocalpyse happens?